Here at Noisecreep's West Coast headquarters, Insomnium are sort of a big deal. Last year, we included them on our 'Best Metal Albums of 2011' list with their One for Sorrow release. Since it was released in late last year, the album hasn't left our playlist. We'll finally get a chance to catch the Finnish melodic death metal masters live since they'll be kicking off a U.S. tour with Epica, Alestorm and System Divide. To help celebrate the tour, Insomnium have put together a video for their album's title track and Noisecreep has the exclusive premiere! 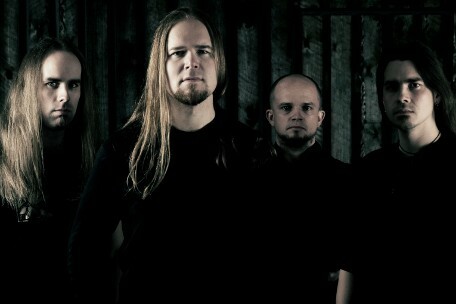 Vocalist/bassist Niilo Sevänen comments on the video: "'One for Sorrow' is one of the best songs Insomnium has ever done. It stands out as a unique kind of track and it clearly deserves a video of its own. It's not your typical melodic death metal song but something else: the essence of the song is not its pace or brutality, but its haunting and melancholic atmosphere. And that mood might be much heavier than any blast-beat onslaught you can create. "The video for 'One for Sorrow' was filmed at Wacken Open Air and Tuska Open Air this summer. The atmosphere at both these shows was absolutely amazing, and I hope this live video conveys the feeling that we were really enjoying our time on stage. After a busy summer and a short break, it now feels good to get touring again. We've been waiting for five years since our last North American tour and finally we have the chance to keep conquering America. We'll be all around the continent, and it will surely be a great tour for everyone. See you soon!" Insomnium's latest album, One for Sorrow, is out now via Century Media and available on iTunes or at CM Distro.